I’d try to be the voice of sanity here So, do bear with me:First & foremost population growth is itself a menace, plaguing society more than any vice could ever do.This exponential growth is unsustainable, proven empirically.Now, onto the more relevant part of your question i.e, Muslims population growth in India is surely an ‘issue’ or to be blunt many jingoist do believe it that way. It’s no concerted attempt by Muslims & their haranguing Mullahs to overawe India, I can assure you! Actually to comprehend this, we need to look it the other way.The inherent backwardness of Muslims, their abject economic & social conditions often forces them to produce larger number of offspring in hope that the plentiful hands would aid them in work. This then turns into a vicious cycle, the more hands, the more mouths to feed & hence, you never break free of poverty & misery. The clergy here continues to spin canard each day to maintain their waning influence on the community.Thus, their best interest lies in obstructing the path to education & a better life for Muslims. Fortunately, Muslims know this & are striving each day to overcome their abject conditions. 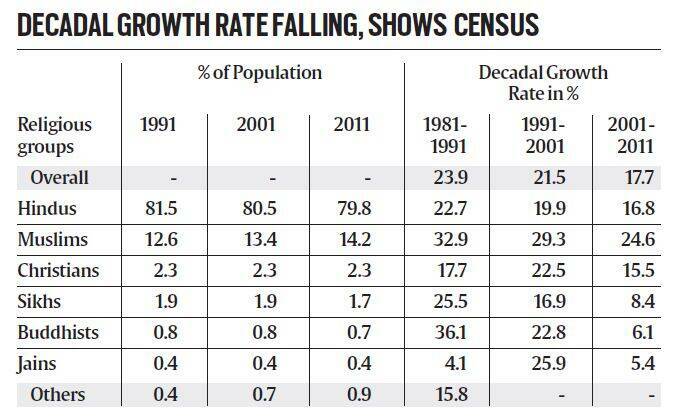 This certainly is visible in 2011 Census, where the Muslim population growth has began to recede.On a different note, education & upward mobility itself deters population growth. As India prospers in decades to come things as such would obviously obfuscate & with it our myopic ‘us’ vs ‘them’ perception. Note: To substantiate my claim, here’s a comparison of percentage change in populations of various demotic groups. Guess you didn’t choose to send rationality & logic down the hill as some have done here, it’s clearly evident that Muslim population growth has in fact decelerated by 4.7% points that’s appreciable.